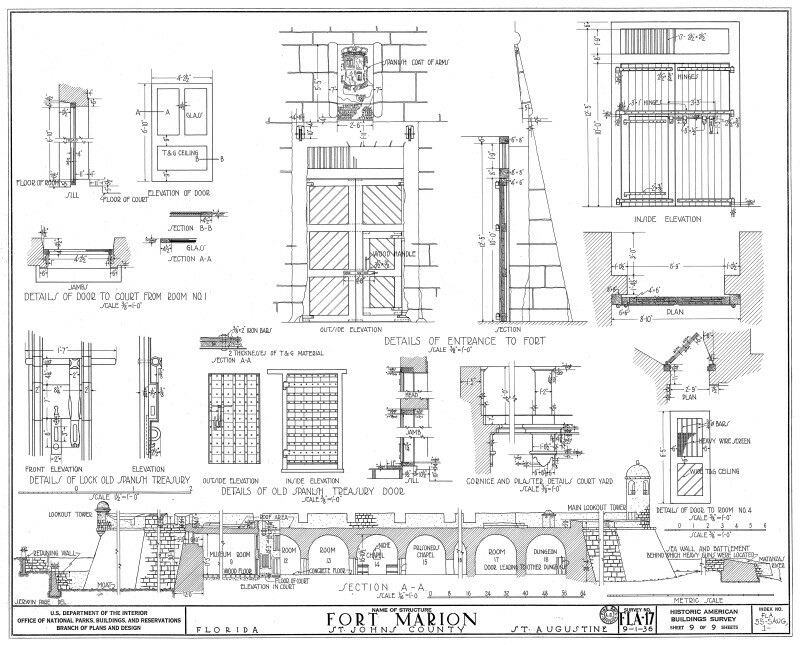 This sheet of architectural drawings from the Historic American Buildings Survey shows a cross-section of the Castillo de San Marcos as well a detail drawings of the entrance door and the door to the Old Spanish Treasury. The Castillo de San Marcos was renamed Fort Marion after the United States acquired Florida from Spain in 1821. In 1942, Congress restored the original name. Drawn September 1, 1936 by J. Erwin Page as a part of the Historic American Buildings Survey. Drawing was downloaded from the Library of Congress Prints and Photographs Division Washington, D.C. and photo edited by the Florida Center for Instructional Technology. WARNING: You are about to download a 3.2 MB TIFF! Normally such a large file is only needed for high quality printing purposes. If you are certain that you need such a large file, click the DOWNLOAD button to begin. If you do not wish to download the large TIFF, just click the × in the top right-hand corner to close this alert. Copyright © 2011–2019 Florida Center for Instructional Technology. ClipPix ETC is a part of the Educational Technology Clearinghouse and is produced by the Florida Center for Instructional Technology, College of Education, University of South Florida. Terms & Conditions. About ClipPix ETC.